1) First put the SheeCool water tank in the freezer for at least 4 hours or in the fridge over night. 3) Wet the rubber air sealer (011) so that the Stem will slide into the water container easily and fits snugly and is airtight. 4) Place the charcoal holder (004) on the top of the Pipe Stem. 5) Secure the ceramic bowl (001) (tobacco burner) on the top of the pipe Stem with the rubber spacer 1 (002). 6) Insert the Hose (010) into the hose connecter (008). Make sure the connection is airtight by using rubber spacer 2 (009). 7) Test that the setup is airtight by placing your hand on top of the Hookah bowl then sucking in through the hose (the setup is airtight when you feel a slight pull on your hand and you see and hear bubbles inside the glass vase). 9) Place charcoal after well lighted onto the aluminum foil or screen and gently press down on the charcoal, while sucking in through the hose. It will take few minutes for the smoke to build up inside the chamber of the water container. The aluminum foil will act as a screen keeping the charcoal from burning the tobacco and to reduce carbon monoxide (CO). 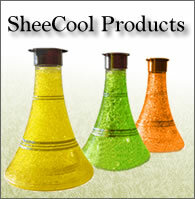 TIPP: Use SheeCool Burner to no more inhaling poisonous carcinogens gases and to save time!